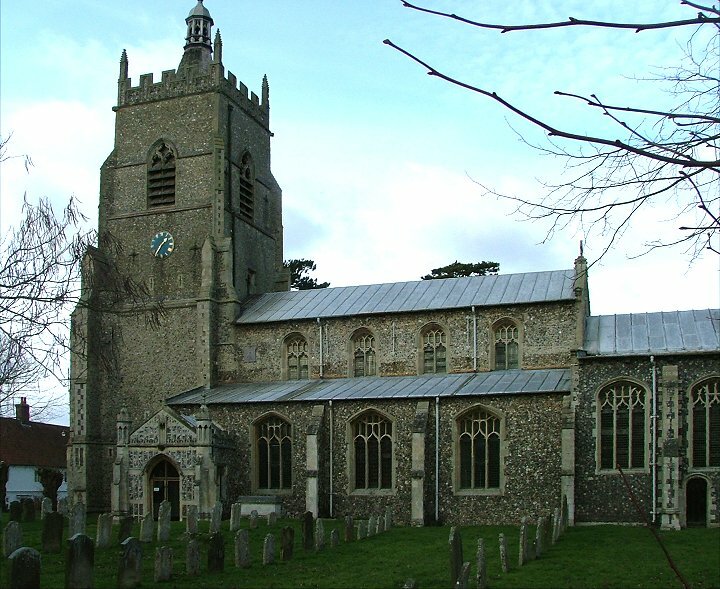 Mattishall is one of the tiniest towns in Norfolk, no more than a village really, but it has at its heart a quite magnificent church. The church is set back from the pleasing little market square. The butcher's shop on the square sells what are quite probably the finest pork pies in England; but it is at the grocer's shop next door that you'll find the key to the church (as the sign on the porch explains precisely, the key is available from 8am to 6pm, Monday to Saturday). 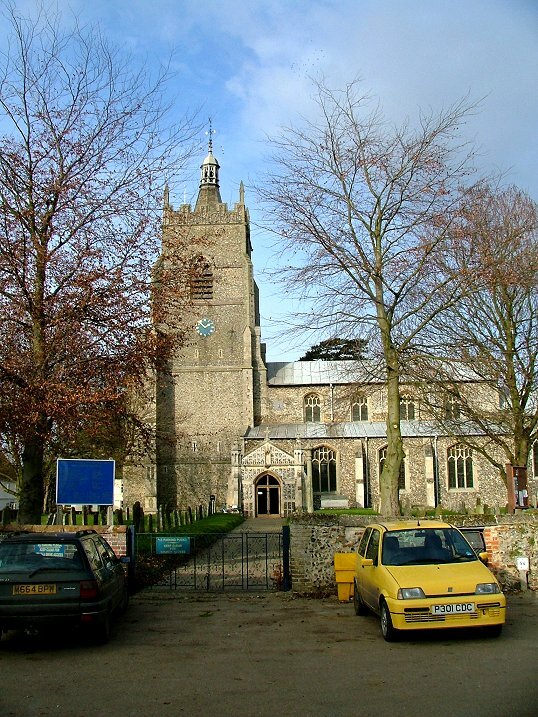 All Saints has echoes of the great urban churches of Swaffham and Fakenham. Apart from the curious Victorian confectionery of the south porch and a 17th century turret on the tower, what you see was all built in one go, in the middle years of the 15th century. 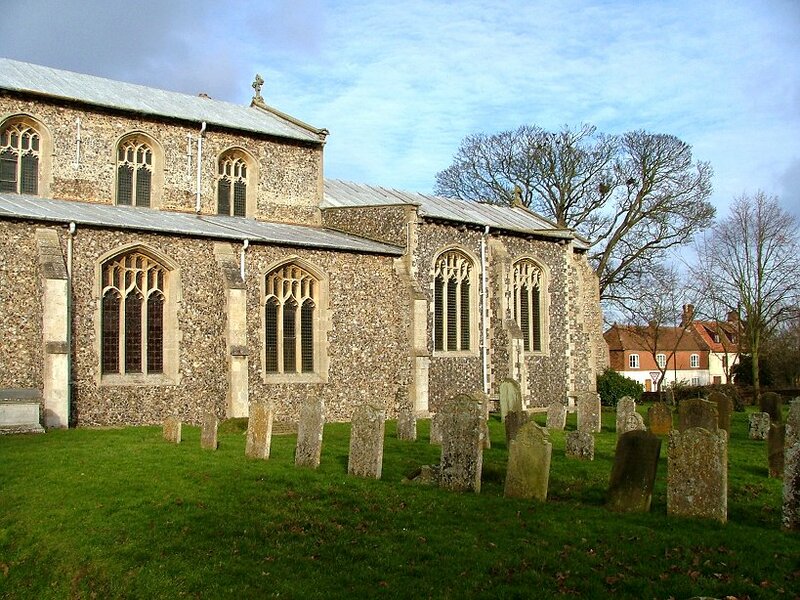 Replete with aisles, clerestory and that long chancel with its side chapels, this is one of the great East Anglian late-medieval churches. You step inside to a vast space with an overwhelmingly urban Victorian feel to it, as if we were in the middle of Norwich or Ipswich. 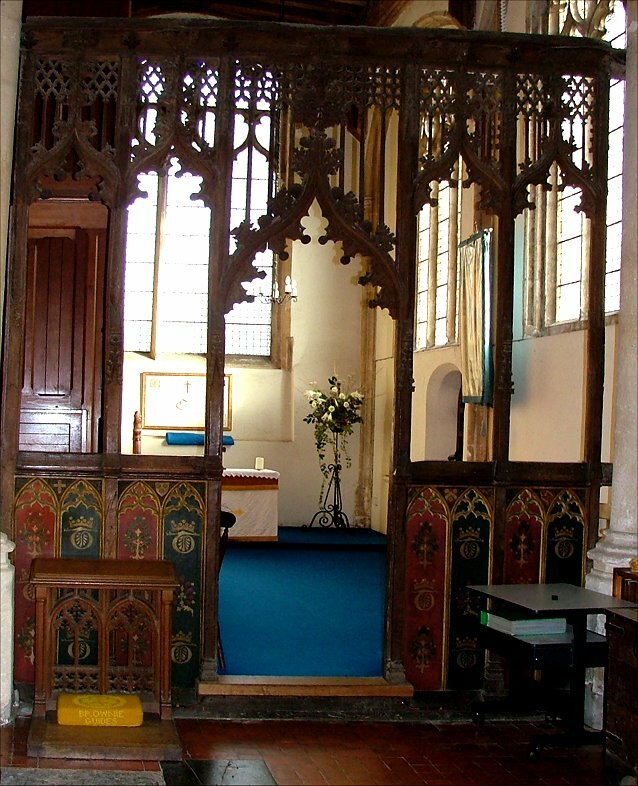 The creamy arcades rise from range upon range of Victorian pews, and you will see something else about All Saints that I will need to mention sooner or later, so I may as well get it out of the way now. 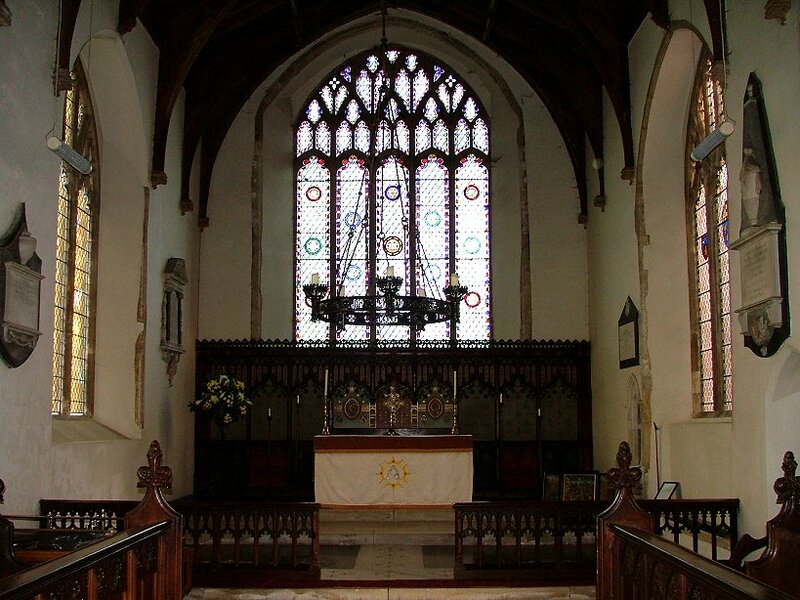 This is a huge medieval space with some of its original liturgical fittings intact, and the Victorians did a thorough job of trying to re-establish its medieval integrity. 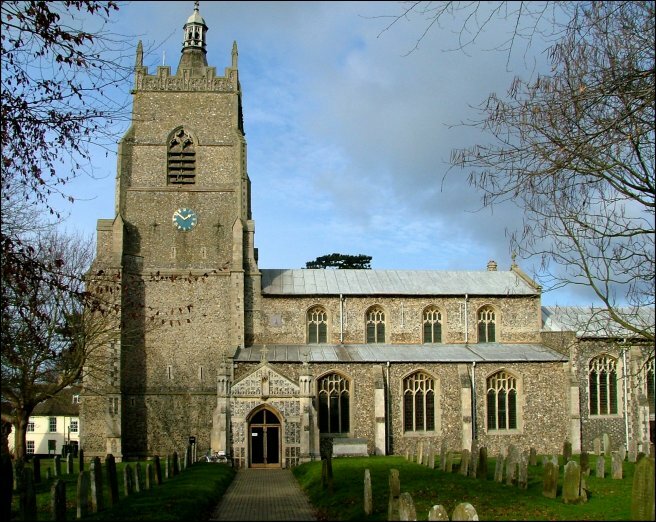 But in a Diocese famous for the number of its Anglo-Catholic hotspots, Mattishall is the most strongly evangelical, charismatic church outside of the city of Norwich. 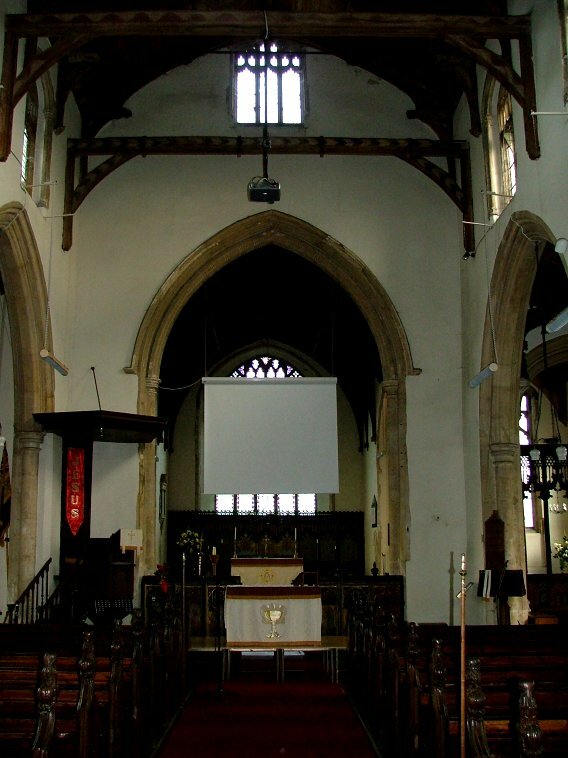 Where you'd normally expect to find a table with leaflets at the back of the church there is a vast mixing desk, and looking to the east there is an overhead projector screen suspended in the chancel arch. 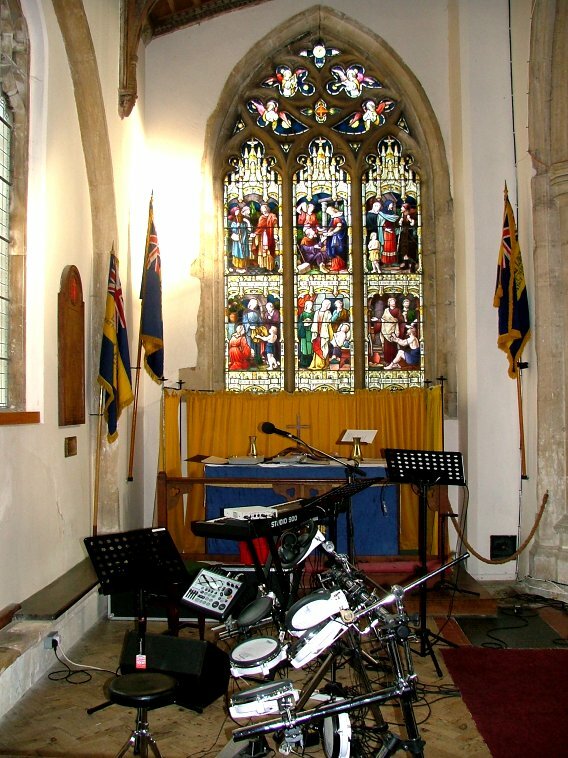 Below it, at the east end of the nave, an array of microphones, amplifiers for electric guitars, a drum kit and a synthesiser. Now, this isn't a style of worship of which I have much experience. But then again, I am not a member of the Church of England, and it isn't really my place to tell Anglicans how to worship. 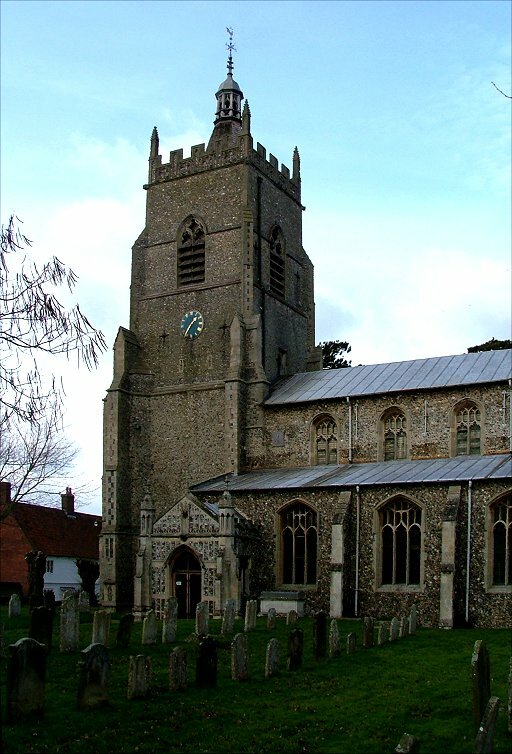 I would say, however, that this is one of the few big, rural churches in Norfolk that is regularly full. Glancing at the mixing desk, I saw that the hymns for the following Sunday included Jesus You're my Superhero, and I saw the words of this song up at the east end on a music stand. There weren't very many of them. But again, there is no reason to think that this kind of thing is any less liturgically valid, or more of a passing fancy, than Mission Praise or the New English Hymnal. And it is obviously meeting a need, and inspiring devotion. 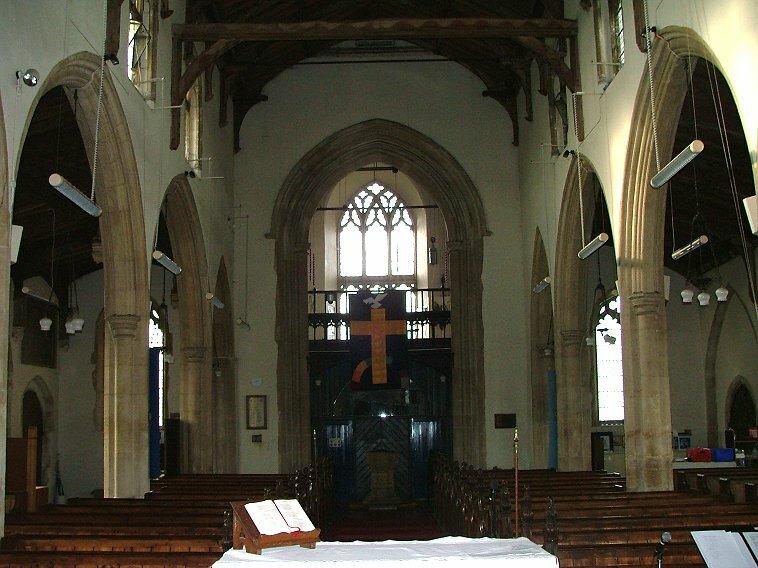 Later in the day, I would speak to a churchwarden at one of the other churches in this benefice, a building nearly as big as Mattishall church. There, they struggle on each Sunday with half a dozen people and the Book of Common Prayer. On the last Sunday in each month, the benefice congregations come together for a united service which the churches take it in turn to host. As you may imagine, the others tend not to go when it is at Mattishall - it's all happy clappy there, said the churchwarden, as if this was explanation enough. Well, that's as maybe. But if I come back in ten years time to see if either of the churches has gone out of business, I think it is a fair bet that it isn't going to be Mattishall. 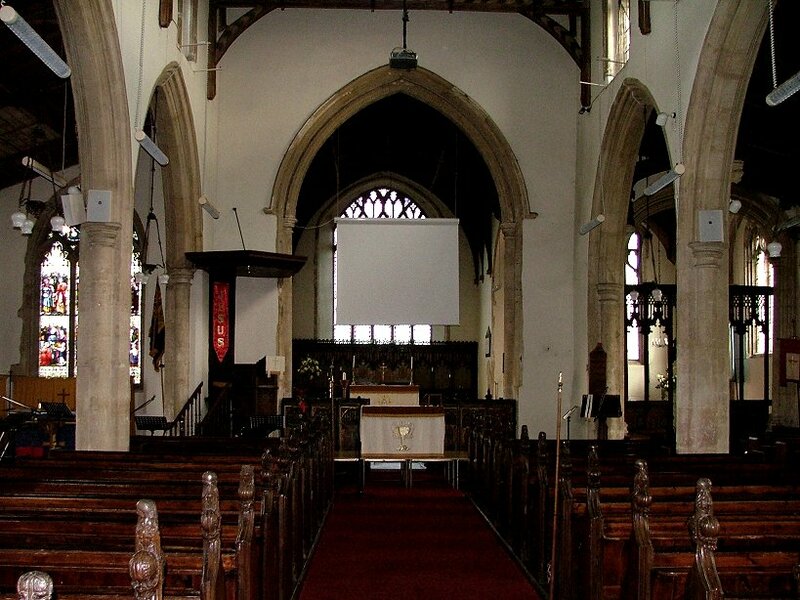 If I had a suggestion to make, it is that the congregation at Mattishall should get rid of those Victorian pews. 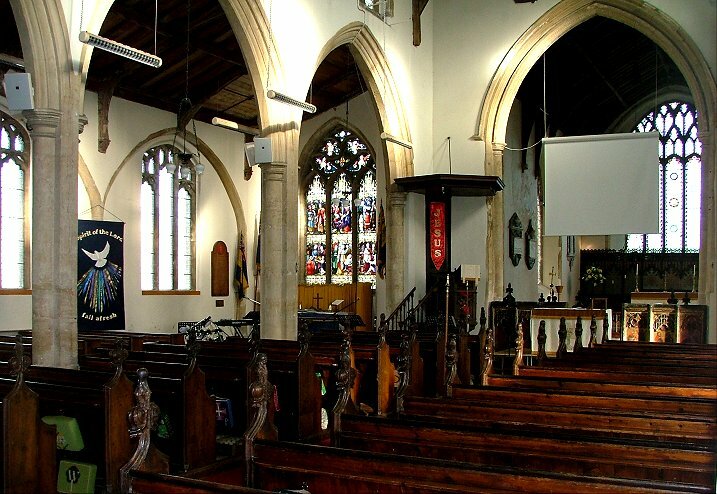 There's nothing particularly traditional about them; as a photograph below the tower shows, they replaced ranks of 17th century box pews, and they have been here long enough. They are not only ugly, they are a hindrance to what the people are trying to do here, and their removal would open up a beautiful vista which would enhance this lovely building. 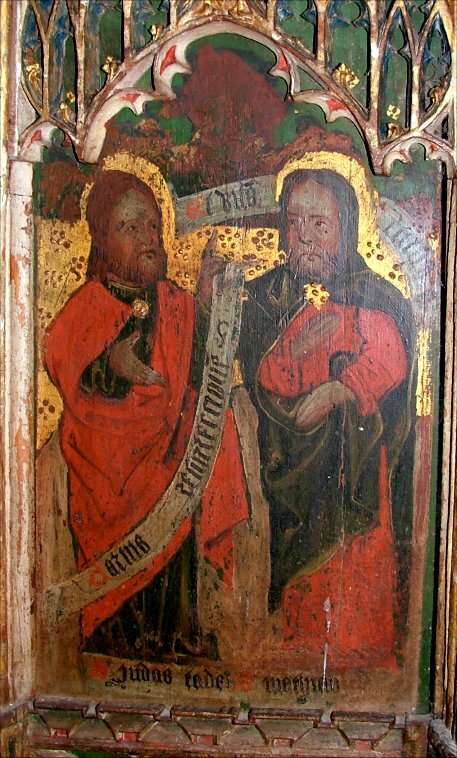 Modern wooden chairs always look good in a medieval space. Mattishall's greatest treasure is beyond the microphones, below the overhead projector screen. 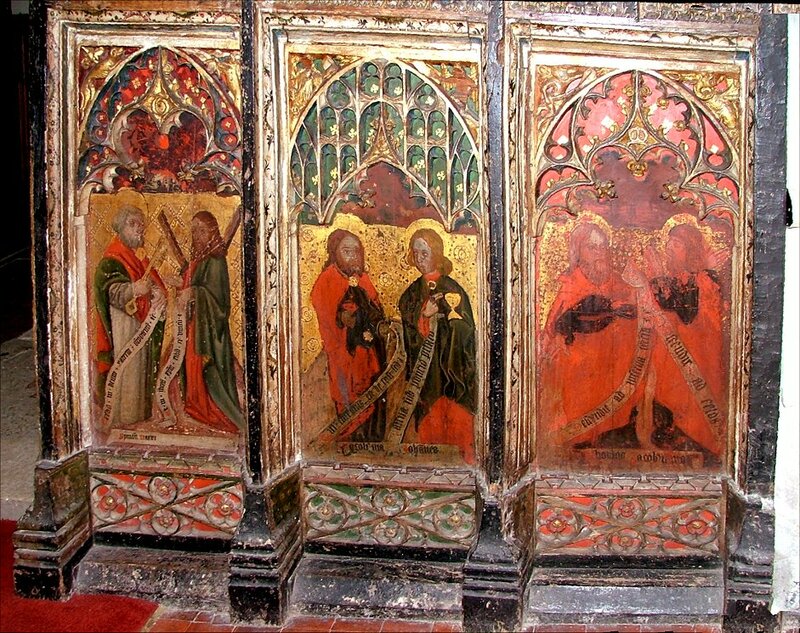 It is the dado of the roodscreen, a work contemporary with the building of the church in the mid-15th century. The panels to each light are not subdivided; that is to say, there are two subjects in each panel. 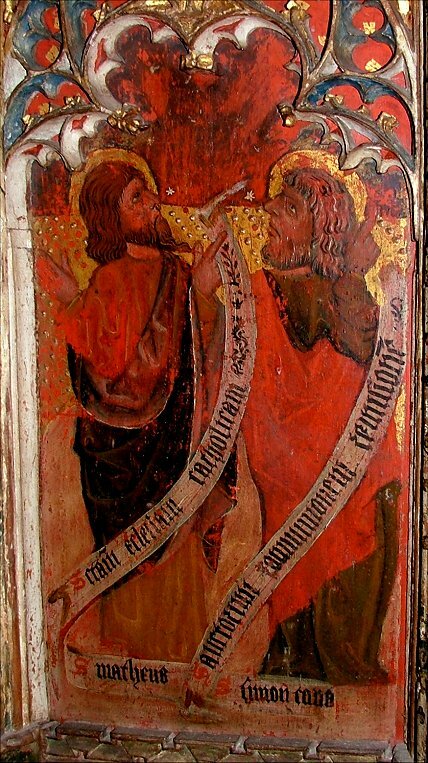 They depict what is known as a Creed sequence, where the 12 apostles hold a sequence of scrolls containing the clauses of the Apostles Creed. 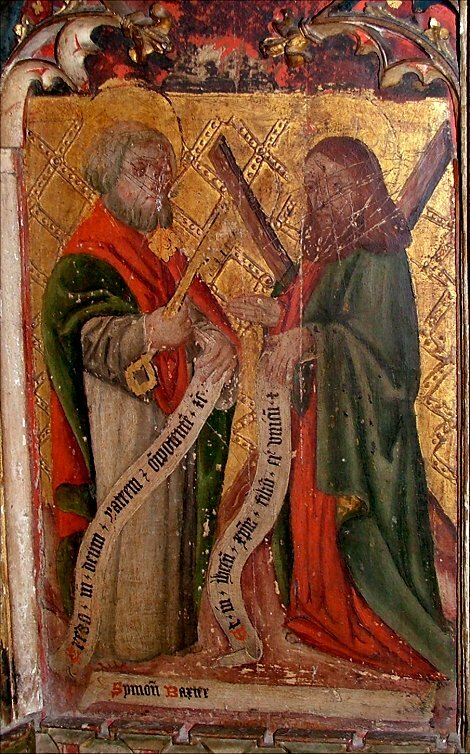 There is a traditional pattern to which apostle holds which clause, and so identification is relatively easy. 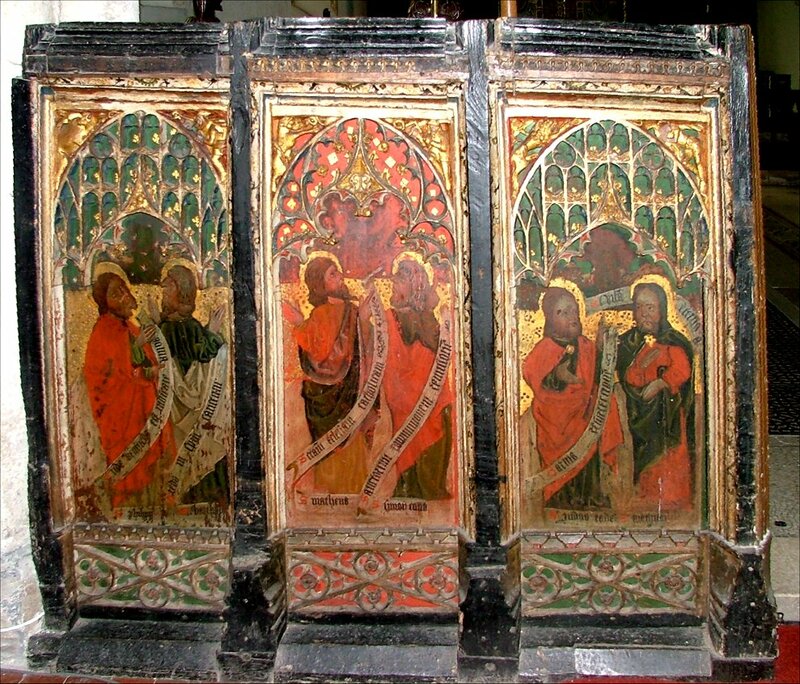 On the north side they are Philip, Bartholomew, Matthias, Simon, Jude and Matthew. On the south side are Peter, Andrew, James, John, Thomas and James the Less. 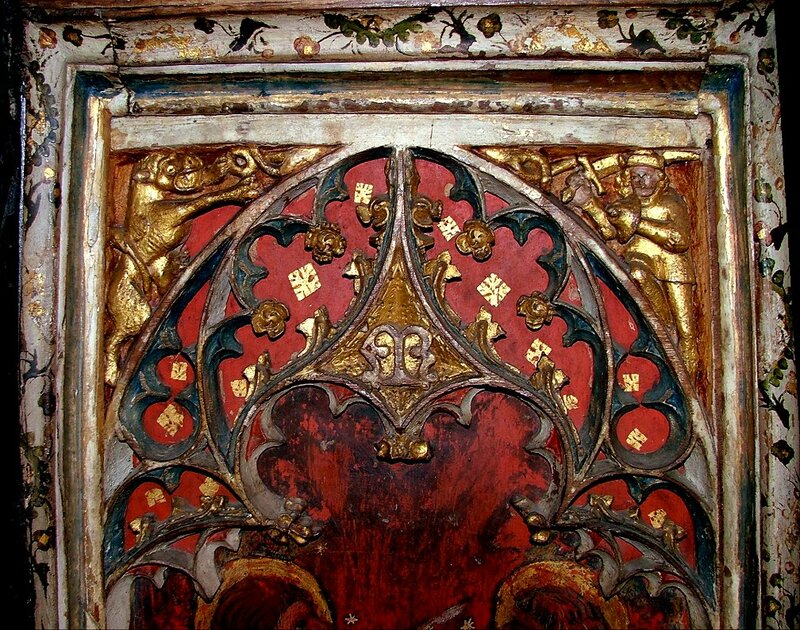 Of more interest, perhaps, is the gorgeous tracery of the panel canopies, and the tiny details in the spandrels. A hooded man creeps up on a dragon, a man with a sword (is it St George?) 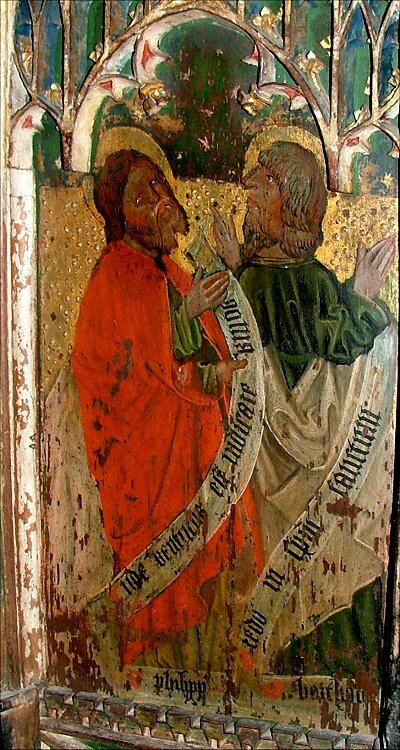 approaches what may be a fire-breathing lion, a thoroughly East Anglian woodwose with a club creeps up on another lion, and in the only vandalised scene Gabriel appears to the Virgin Mary at the Annunciation. 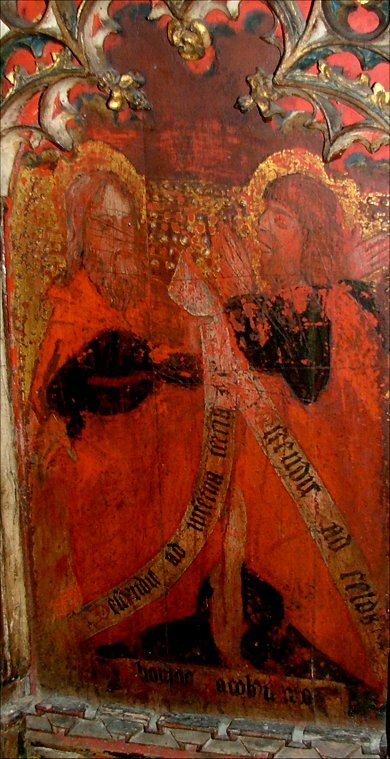 Details of the screen can be seen below. Hover over them to read the captions and click on them to see them enlarged. 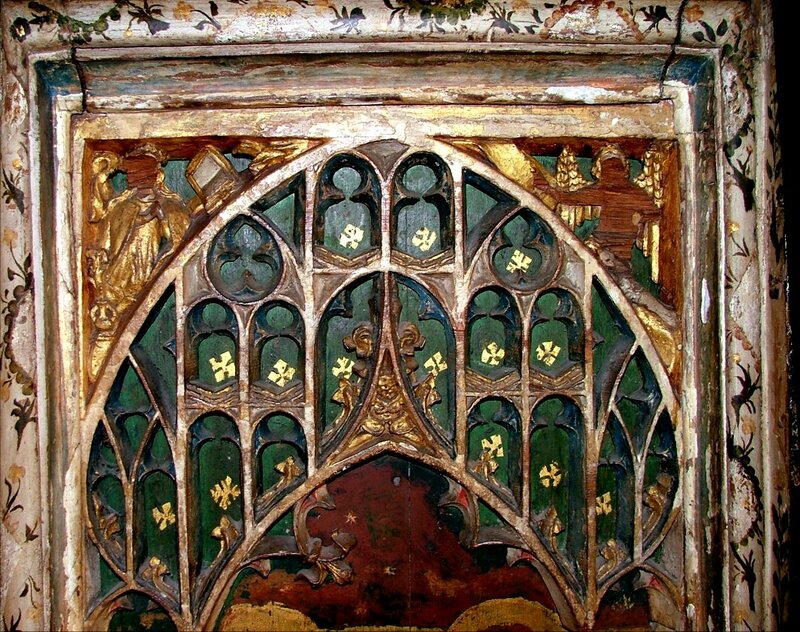 There is another screen into the south chancel aisle, beautifully patterned. 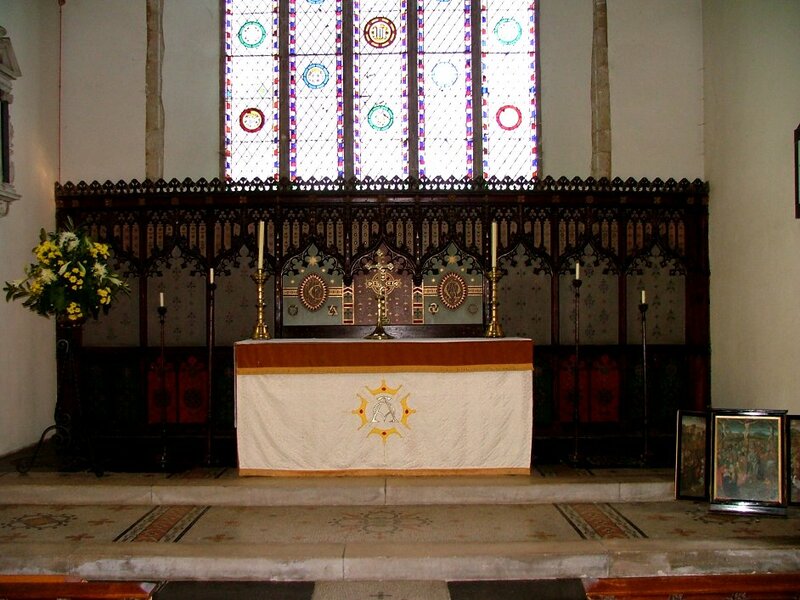 All Saints has three dressed altars, but perhaps the one in this chapel is the most beautiful. 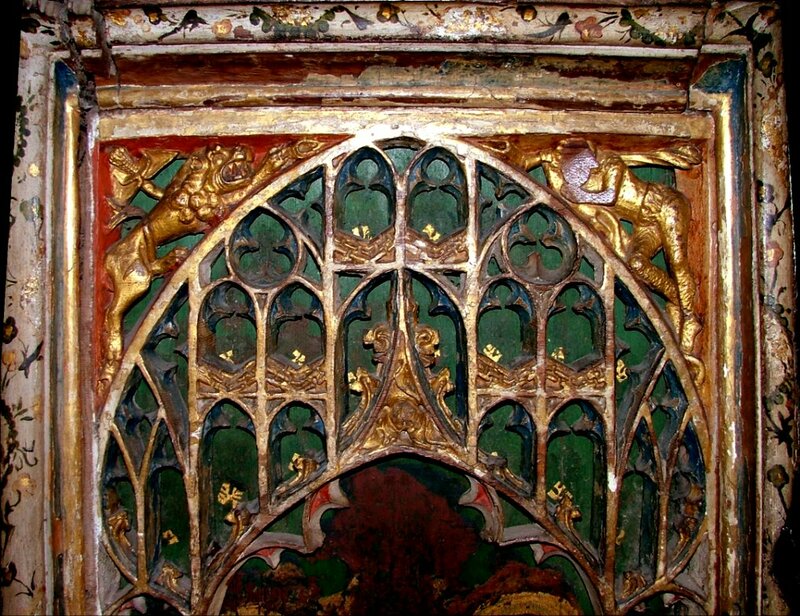 In the middle of the chancel are a number of oddly placed brass inscriptions of the 17th century that are presumably to the same family, but the surname is spelt variously Cresheld, Croshold, Crolhold and Crollold. These are all post-Reformation of course, but another back in the nave asks for prayers for the soul of Katherine Dene. 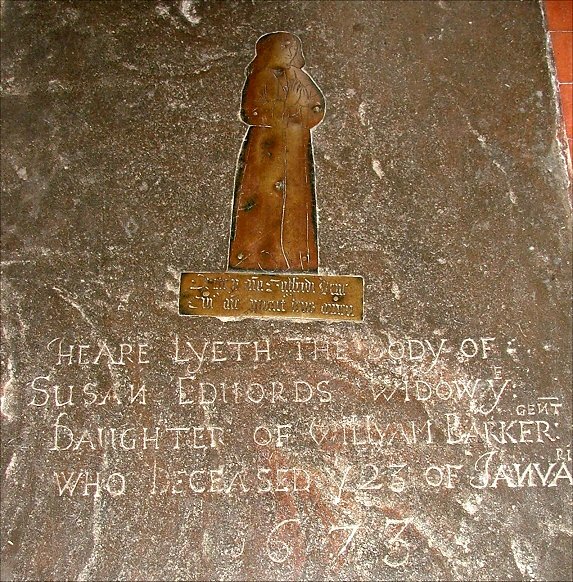 There are a number of medieval figure brasses in the nave, but they have been reused on late 17th century ledger stones. 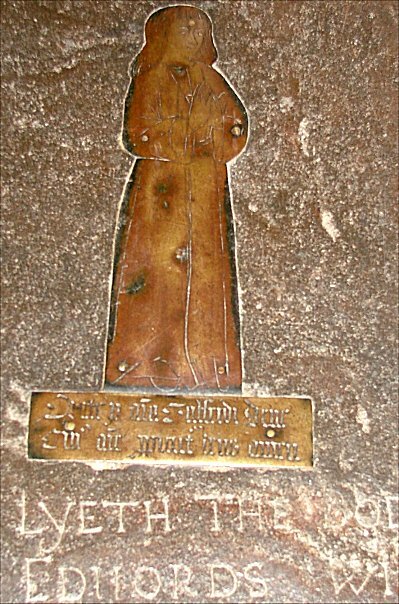 One, to Geoffrey Dane (presumably a relative of Katherine) is now resplendent on the tomb of Susan Edwards, a curious cross-gender arrangement. 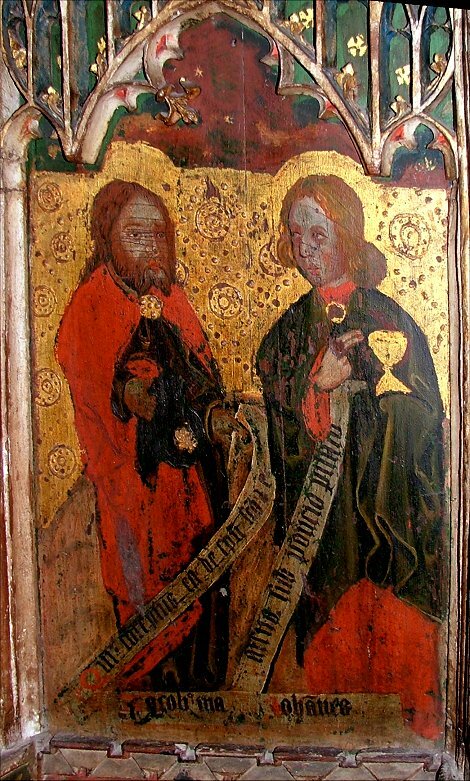 Perhaps they were unable to read the Latin, and assumed that the long hair made him a woman. 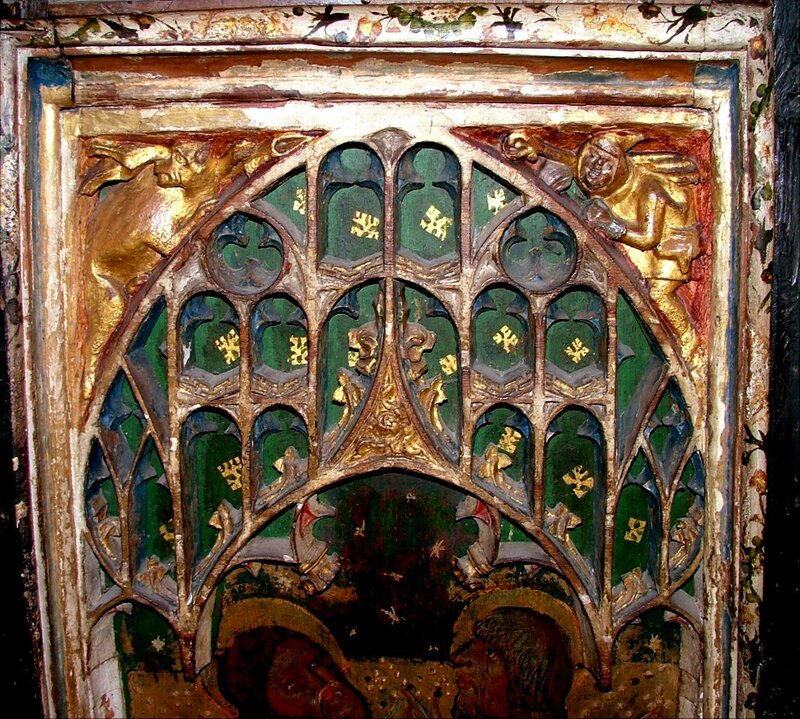 No less than two brass figures have been reused on the 1688 tomb of William Brabant. He was Rector here, and obviously thought well of himself, or someone did. The font is a curiosity. 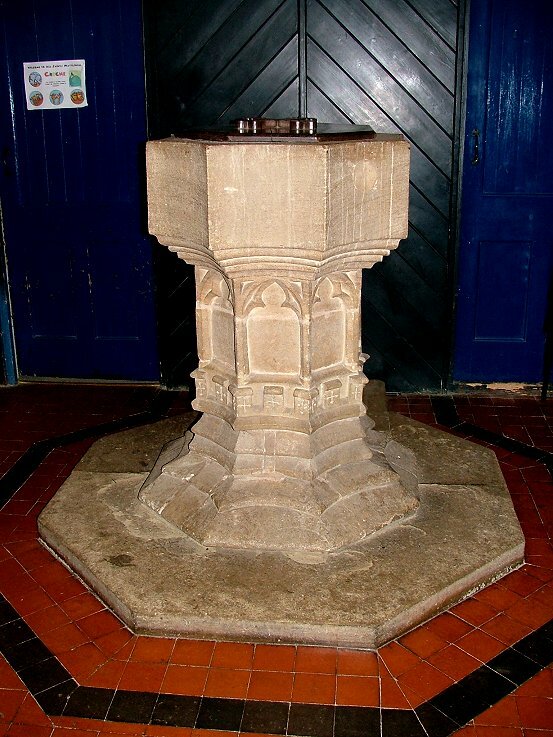 It has no designs on the eight panels of its bowl, but all of them are concave. The traceried panels of the shaft appear to be medieval. Can the bowl be old as well? 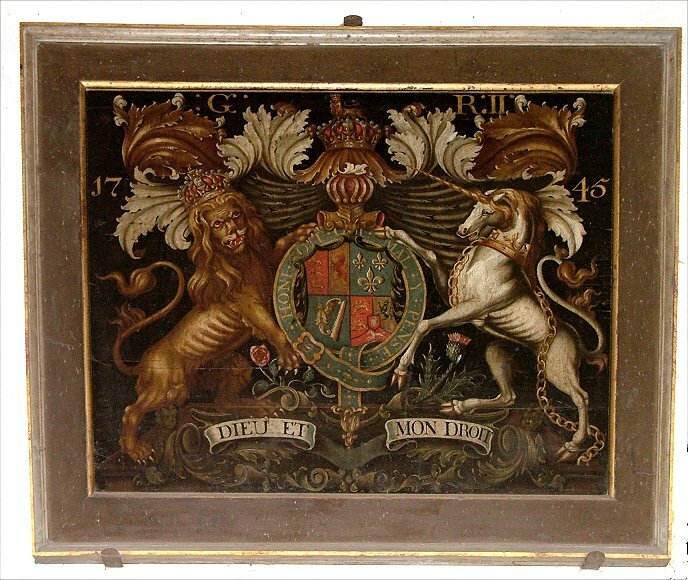 High above, the Royal Arms are to George II, and are only remarkable for being dated 1745, a notable date in English, Scottish and Irish history. Charles Stuart's attempted coup de'etat was a romantic fancy, and had no real chance of succeeding, any more than his grandfather James II was ever likely to have held onto his throne more than half a century earlier. And things would not have turned out well if it had succeeded. The power of the protestant London merchant classes, which had formerly backed Cromwell, had also guaranteed the success of William of Orange's takeover of the English throne in 1688. That power was now deeply invested in the Hanovers. The Church of England and the regular Army, those two constant, essential arms of government, reacted to the uprising by forging a consensus which would be the key to the imagination of the people, a notion of identity which would at last reinvent and create the British as a Nation. Nothing would bend it from its path now. Meanwhile, in the rural backwaters, the Catholic aristocracy was little shaken by the events of '45. Perhaps they stirred, and perhaps they read their newspapers with a frisson. But after all, they were only just awakening from the long years of penal silence. Although the Old Religion was still technically outlawed, they were no longer persecuted, and many began to retake their place in the national heirarchy. It was a compromise, but an ordered and easy one.